Part of an integrated small-angle neutron scattering (SANS) instrument suite at ESS, SKADI analyses materials’ structures at the largest scales possible with neutron diffraction. This is the fifth in a series of articles highlighting the instruments selected to enter Phase 1: Preliminary Engineering Design, for the European Spallation Source (ESS) suite of instruments. Twenty-two instruments are anticipated at ESS. The instruments in this series are expected to enter the ESS user program by 2023 and will address the needs of the ESS core user community. They have been selected through a rigorous but inclusive, community-based process that begins with an open call for proposals, moves through reviews by experts inside and outside ESS, and ends with a recommendation to advance into Phase 1 by the ESS Steering Committee. The full proposal and selection process is described here. SKADI: Small-Q, long length scale. Key advantages of SKADI over existing instrument technologies, from the proposal. 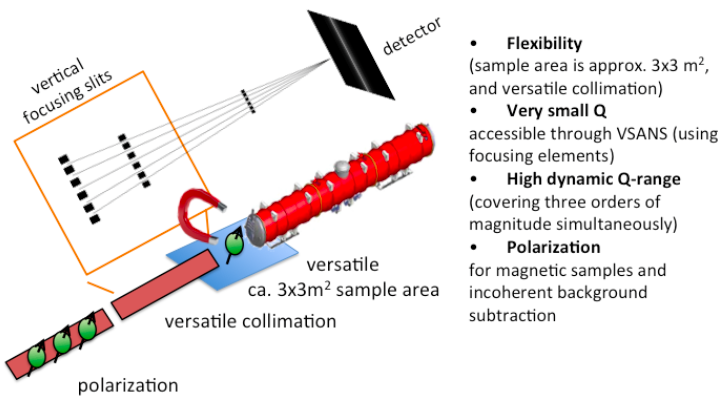 NEUTRON SCATTERING AT THE EUROPEAN SPALLATION SOURCE (ESS) will be one of the world’s most powerful tools for evaluating the structures and behaviors of materials across a wide range of length scales—from the atomic level, to nanoparticles, and up into the hundreds of micrometers. Small-angle neutron scattering (SANS) is a frequently used technique that enables experiments along the higher end of these neutron-resolved length scales. Allowing for simultaneous measurements of larger structural properties across three orders of size magnitude, ESS’s Small-K Advanced Diffractometer, or SKADI, will prove decisive in discoveries over the next half century across a staggering range of scientific disciplines. The SKADI project is a German, French, and Dutch collaboration. The instrument was proposed by SANS expert and instrument builder, Dr. Henrich Frielinghaus of the Jülich Center for Neutron Science (JCNS) in Germany and his JCNS colleague, Dr. Sebastian Jaksch. Today, Frielinghaus serves as the project’s senior advisor, and Jaksch continues the work with research teams at the Laboratoire Léon Brillouin (LLB) in France and the Delft University of Technology in the Netherlands. The French group, headed by Dr. Jacques Jestin, will share in the construction of SKADI and provide the VSANS add-on technology. 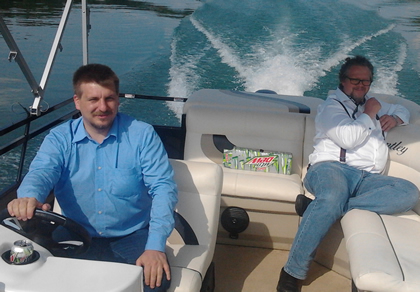 Dr. Wim Bouwman leads the Dutch group, which will supply SKADI’s SESANS technology. Sebastian Jaksch and Henrich Frielinghaus. SANS can fully exploit the high flux of the ESS source owing to the technique’s relatively relaxed requirements on resolution. For data gathering with SANS, the more neutrons available, the more flexibility a researcher will have for an experiment. Feature-rich instruments that can capitalize on ESS’s high brightness and long-pulse beam structure are a must for the facility, where the anticipated needs of researchers a decade on need to be as broadly accommodated as possible. 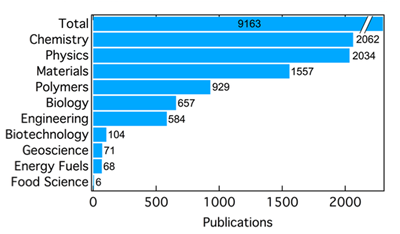 Statistics about SANS publications in the years 2000-2013 sorted by topics. It will be a task of SKADI to support the less well-presented topics in the near future. 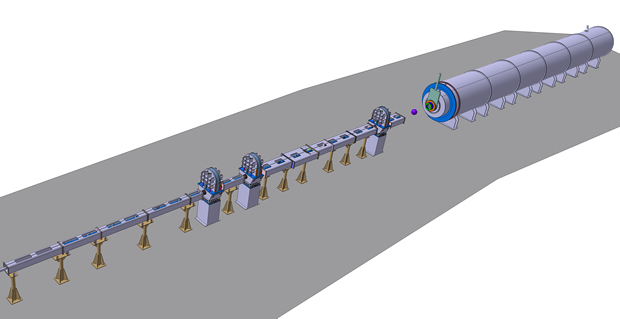 At 55 meters in length, and with a maximum sample-to-detector length of 20 meters, the SKADI diffractometer will be the best instrument available for the study of structures and processes at the largest possible length scales for neutron diffraction. Before conducting an experiment, neutron scientists must identify the SANS instrument that delivers an optimal range of neutron wavelengths for their sample, a specification strongly influenced by the instrument’s length. In general, longer instruments are better suited to direct neutrons at smaller angles, which allows for the resolution of larger structures within a sample. SKADI’s physical proportions, its large sample area to accommodate diverse in situ arrangements, and its dual, adjustable-length detectors ensure the instrument’s effectiveness for the broadest range of samples within the most refined conditions. The add-on technologies of polarization, very small angle neutron scattering (VSANS), and spin-echo small angle neutron scattering (SESANS) extend SKADI’s capabilities significantly. The user community anticipated for SKADI reaches across nearly the entire pantheon of materials science and biophysics research, and—thanks to the instrument’s ease of use—may expand SANS research opportunities for underrepresented fields such as energy and food science. 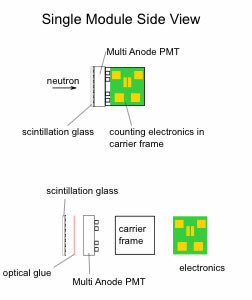 Dual detector arrangement schematic and SoNDe detector scintillation concept, courtesy of S. Jaksch. SKADI’s design includes two moveable detectors set in series within a 20-meter-long vacuum tube. The first of the two detectors is designed with an aperture in its center where neutrons traveling at lower angles pass through to the second detector. This arrangement allows for the detection of neutrons scattering along different vectors simultaneously, and thus the instrument’s unprecedented range of length scales revealed through a single experiment on a single sample. The two-detector arrangement cuts down on measurement time because each measures a different range of Q values simultaneously, and the detector need not be repositioned for each measurement. It also enables fast kinetic experiments, where the sample is permanently changed once a reaction completes: researchers can get a single-shot, comprehensive measurement of scattering data from a sample that would otherwise be impossible to measure a second time at another angle. This means a researcher can monitor both the static structure and the processes that create that structure, a perspective vital for understanding chemical or biological processes. SKADI’s VSANS technique, which uses a multi-slit collimation setup, will allow for ten times smaller scattering angles, while its SESANS technique reaches for yet smaller angles. These methods increase the instrument’s resolution to microns and tens of microns respectively, allowing for analysis of materials at even larger length scales than standard SANS. Visualization at these larger scales is key to advanced research on colloidal systems such as industrial paint and sunscreen, products whose effectiveness relies largely on researchers’ ability to resolve their complex suspension structures. SoNDe detector schematic, courtesy S. Jaksch. SKADI will also be adaptable to experiments requiring “real-world” sample environments and non-standard sample geometries by accommodating the heavy-duty equipment that enables them. By controlling temperature, pressure, mechanical strain, and electrical or magnetic fields, researchers can simulate, for instance, the extreme conditions found underground in order to study greenhouse gas (CO2) sequestration in rock structures, or apply magnetic fields to the nanoparticles that figure in the novel cancer treatment known as hyperthermia. To take full advantage of the high neutron brightness of ESS, the SKADI team is working with ESS to develop a new solid-state detector type called SoNDe, an acronym for “solid-state neutron detector”, and also the German word for “probe”. 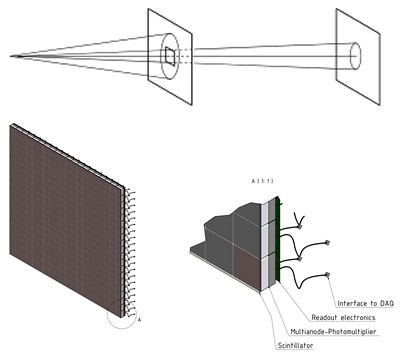 The detector system combines modular photomultipliers, a well-known technology, with a lithium scintillation converter to detect neutrons with an estimated 80% efficiency. It also avoids the use of helium-3 technology, the industry-standard detection medium that is increasingly difficult to obtain. Last month, the SoNDe detector project received a roughly 4 M EUR grant from Horizon 2020, the European Union Framework Program for Research and Innovation. The JCNS group will coordinate the project among ESS, Lund University, LLB, and Integrated Detector Electronics, a private company in Norway. Layout of SKADI after the beam preparation, from the proposal. For clarity, shielding is omitted. From left to right: Slim and wide collimation with choppers at 11.5, 14.5 and 21.5 m, sample position (lilac sphere) and the detector tube.